Since our founding in 1997, Hopscotch Interactive has been focussed on ways to help people identify and learn about nature in their local area. We remain a small company run by two biologists with a passion for science and nature education. Initially we provided a wide range of publishing and project management services, more recently we have specialized on mobile nature guides and their applications for urban parks and natural areas. Online regional identification guides to common birds, amphibians and fish of Ontario (ROM). Species-at-risk website profiling Ontario's species at risk (OMNR). A Guide to the Mammals of the Iwokrama Forest published online and in print form (Iwokrama International Centre, Guyana). 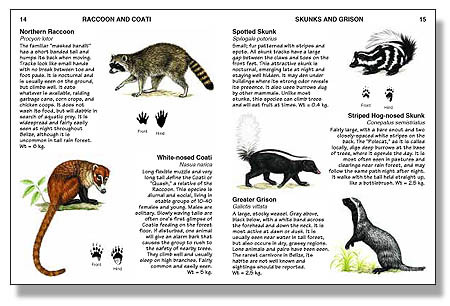 Digital print guides to Mammals of Costa Rica, and to Mammals of Belize (published by us for author and illustrator Fiona Reid). Our own Spring Wildflowers of Toronto, printed as a unique pocket-sized flashcard set of the 33 common and distinctive spring wildflowers of Toronto's natural areas. Web-based educational games for undergraduate teaching in ecology, evolution and behaviour at the University of Toronto. Titles included: Counting Plants and Animals, where students learn how to estimate population size of plants and animals in Algonquin Provincial Park; Evolution of Cooperation, where students learn about Prisoner's Dilemma game and its applications in animal behaviour (this game has proved very popular and has been adopted by several Universities). Optimal Foraging Game, which teaches students about how animals feed efficiently in a patchy habitat, using the hummingbird as an example. Saving the Whooping Crane, in which students apply population growth principles to management of an endangered species. Online Migration Monitoring websites, for shorebirds (WASA, NOAA, USFWS) and for Striped bass (Rutgers University). Other work. We have developed and managed content management systems for some clients' websites (e.g., Evergreen, Federation of Ontario Naturalists). Hopscotch Interactive is located in Toronto, Canada. If you have any questions, or need further information, please do not hesitate to contact: Mike Dennison dennison@hopscotch.ca.